1. 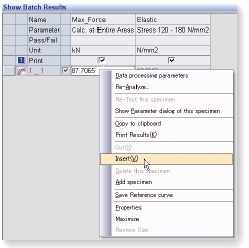 Search files and select parameters quickly by simply touching the screen to perform consecutive tests efficiently. Search files and select parameters quickly by simply touching the screen to perform consecutive tests efficiently. As more test results and parameter files accumulate over time, file can be searched by keywords or date. In addition, reports and setting lists can be previewed to recall files easily. 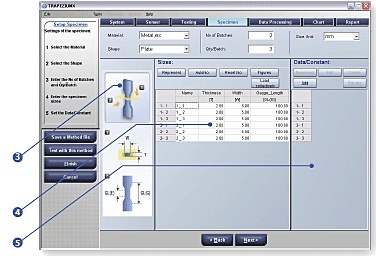 Complicated parameter settings can be specified while viewing the overall process flow using the Test Parameter Wizard. 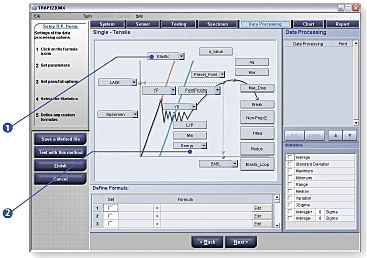 Guidance for operating procedures is linked to the software help function and displayed on each screen. 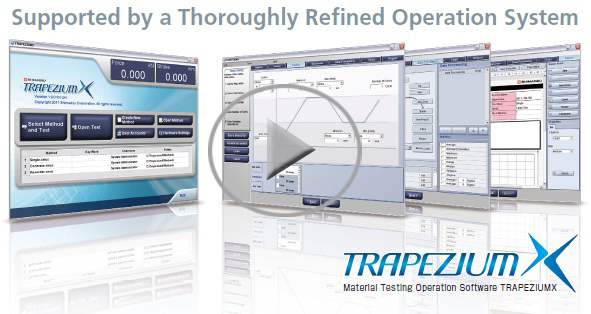 Easy-to-understand illustrations are used for test control, specimens, and data processing parameter screens. Specifying settings is now much easier. ① Typical data processing parameters have been prepared in advance. Parameters can be specified easily by simply touching a button on the corresponding illustration. ② The illustration changes automatically depending on the test mode and specimen material selected. ③ An illustration is displayed for each specimen shape. This makes it clear at a glance what dimensions need to be entered. ④ Dimensions can be entered manually or automatically from an Excel list or using electronic calipers. ⑤ In addition to dimensions, information can be entered for each specimen. 1. The Quick Setting Panel enables quickly entering speed, dimensions, report information, and other settings directly into the Main screen. Only the functions needed for the given testing situation are displayed as Navigation buttons. This means that the system can be efficiently operated with confidence for consecutive testing by simply touching visually large buttons. Furthermore, a teaching function is provided, which learns from user operations in each situation to add new buttons to the navigation bar for frequently used functions. This means that the more the system is used, the better it fits the user's operating style and the more quickly operations can be accomplished. Portions of batch test results can be retested and replaced with new results. The total number of tests can be increased by adding batch numbers (or lot numbers). Test result files can be selected and merged. It also enables statistical processing. Reports can be created that contain test results, graphs, photographs, logos, or other graphical content. The layout and size of items in reports can be freely changed. Fonts, colors, borders, and other features can be specified in detail for each item. 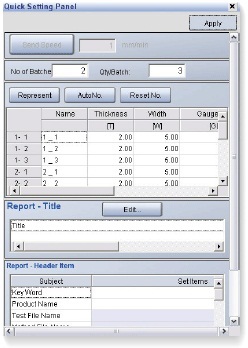 Reports created using Report Designer can be output in various file formats. This allows freely customizing reports using software preferred by the user. By installing the WebPlus function (optional) on the server, networked computers without TRAPEZIUMX installed can be used to reanalyze data or print reports via Internet Explorer.